Mark Holmes was born in the UK and lived in Manchester until the family moved to Toronto. He met several other musicians and formed a punk band that played covers to The Police and other new wave bands. After a lineup change, Holmes was playing guitar and the lead vocalist, Chris Steffler was the drummer and Sergio Galli was a second guitarist. The trio became Platinum Blonde. They got a record deal with CBS in 1983. Their debut album, Standing In The Dark, earned them two Video Of The Year nominations at the 1984 Juno Awards. 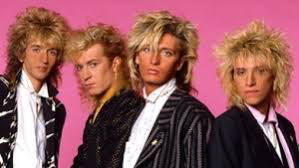 But it was their second album, Alien Shores, which included “Crying Over You”, a #1 single on the Canadian RPM charts in 1985, and in Vancouver. Another Top Ten hit in Canada from Alien Shores was “Situation Critical”. A third single, “Hungry Eyes”, also made the Top Ten in Vancouver. With the release of Alien Shores, Platinum Blonde featured a fourth band member named Kenny McLean. He played the keyboards and bass guitar. Chris Steffler left the band and was replaced by Alexander Tukatsch, who went by the name Sascha. A third album was released in 1987 titled Contact. 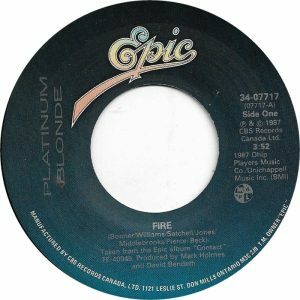 The title track was a Top Ten hit in Vancouver, as was “Fire”. “Fire” was a cover of the 1975 R&B hit by the Ohio Players, a band originally from Dayton, Ohio. The Ohio Players were an R&B funk band who took “Fire” to #1 on the Billboard Hot 100 in February 1975. The song was infused with energy and eroticism and considered edgy for its time. The Ohio Players topped the Hot 100 and R&B charts the following year with “Love Rollercoaster.” Platinum Blonde managed to create some energy and excitement in their recording of “Fire”. The song is about a woman who knows how to start a flame in a guys heart and get him hot and bothered about her. The way she walks and talks sets off a full alarm inside of him. “Fire” climbed to #7 in Vancouver and #13 in Ottawa. Another single from Contact, “If You Go This Time”, made the Top 20 in Vancouver. The band released another album in 1990, but soon parted ways. They reunited in 2012 and released an album titled Now And Never. With the release, they mounted a reunion tour. After the election of Donald Trump to the presidency of the United States of America, Mark Holmes told a reporter for the Calgary Herald: “People need to become hippies again.” Eric Volmers of the Calgary Herald finds the statement ironic, given Platinum Blonde were “the epitome of Canada’s fledgling video age of the 1980s, where successful acts understood that a carefully constructed, video-friendly image was key to burrowing into Canada’s pop-culture consciousness.” So, not exactly hippies. In 2017, Platinum Blonde did a show in White Rock, BC, another at Ambleside Park in West Vancouver that summer, and at the Queen Elizabeth Theatre in Vancouver in November. In 2018, the band appeared in only a handful of concert venues. This included a concert on September 8, 2018, in Vernon, BC, with Loverboy. Eric Volmers, It Does Really Matter: Platinum Blonde’s Mark Holmes Says World Ready For a Musical Revolution, Calgary Herald, Calgary, AB, January 27, 2017.